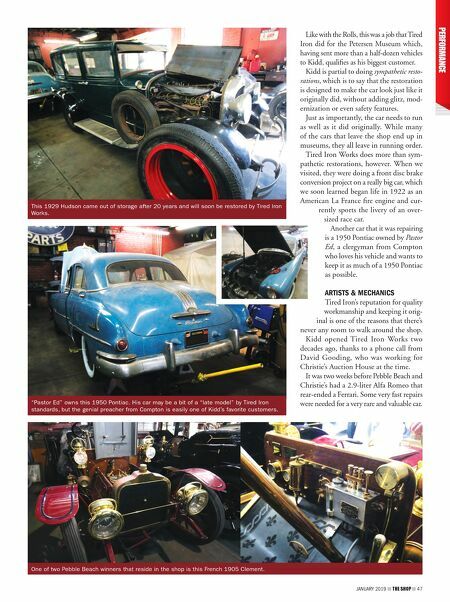 46 THE SHOP JANUARY 2019 T he beautiful Foothill Mountains of the San Gabriel Valley in Mon- rovia, California seem an ideal setting to spend your days repairing and restoring the classic cars of yesteryear. Chris Kidd, owner of Tired Iron Works, agrees. Let's face it—today's cars are faster, better built and more efficient than cars of bygone eras, by a wide margin. A few of them are even beautiful works of art in their own right. But nothing made today can compare to the beauties of yesterday. There is just something about those old cars, whether we see them on the road or in a museum, that harkens back to a simpler time. Those beasts of the past, with their leaking carburetors, seemingly useless exhaust systems and billows of black (and sometimes blue) smoke, can bring a tear to the eye of a grown man (especially if he is standing in that massive puff of smoke). Still, most of us in the automo- tive repair industry would happily trade a 2019 supercar for that one perfect car we reminisce about from our youth. Which one? That's a personal decision, and depends on your taste. But a good place to start may be with The Round Door Rolls-Royce. AN ICON'S JOURNEY This Rolls-Royce Phantom ragtop was originally built in 1925 for Horace Dodge's widow and shipped to her estate in Great Britain (partly, we're certain, because the scandal would've been extreme had she had it shipped to her estate in Detroit). Once received, however, Anna Thompson Dodge despised it, so she sold the car and it began its journey into infamy. Several owners later (at least that's what we've been told, as the true records were destroyed in a World War II German air raid) its original Hooper coachwork was scrapped and replaced by the radical design of Jonckheere Bus Company of the Neth- erlands. The car had an extremely colorful history after that and eventually ended up in a store window in Japan, when the Petersen Automotive Museum in Los Angeles pur- chased what remained of the car. The museum had it shipped to its most reliable and talented builder, Tired Iron Works, in boxes. At the moment, the car greets visitors to the museum the very moment that they enter the front door. Kidd's workmanship is that good. 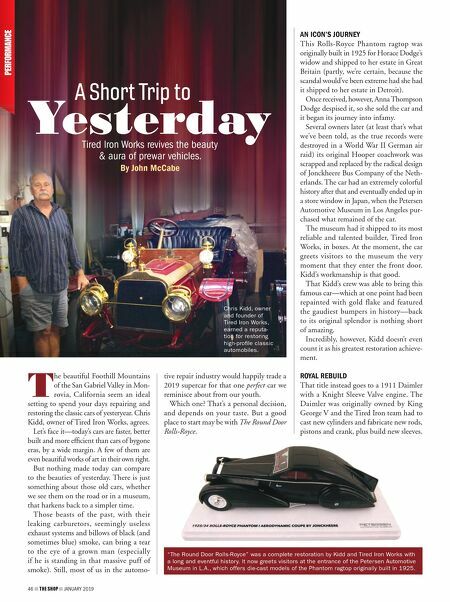 That Kidd's crew was able to bring this famous car—which at one point had been repainted with gold flake and featured the gaudiest bumpers in history—back to its original splendor is nothing short of amazing. Incredibly, however, Kidd doesn't even count it as his greatest restoration achieve- ment. ROYAL REBUILD That title instead goes to a 1911 Daimler with a Knight Sleeve Valve engine. The Daimler was originally owned by King George V and the Tired Iron team had to cast new cylinders and fabricate new rods, pistons and crank, plus build new sleeves. A Short Trip to Chris Kidd, owner and founder of Tired Iron Works, earned a reputa- tion for restoring high-profile classic automobiles. Yesterday Tired Iron Works revives the beauty & aura of prewar vehicles. By John McCabe "The Round Door Rolls-Royce" was a complete restoration by Kidd and Tired Iron Works with a long and eventful history. It now greets visitors at the entrance of the Petersen Automotive Museum in L.A., which offers die-cast models of the Phantom ragtop originally built in 1925.